The New York Islanders lost a goaltender but won a game. PA Parenteau scored the first of New York's four second-period goals and the Islanders hung on to beat the Montreal Canadiens 4-3 on Thursday night, ending a four-game losing streak. The four-goal outburst came after Rick DiPietro replaced Evgeni Nabokov 7:55 into the game. 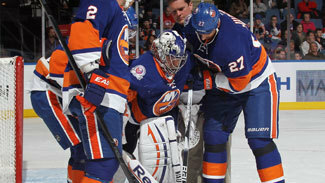 Nabokov left with a groin injury after making a pad save on Montreal's Brian Gionta during a power play. DiPietro, who hadn't played since Nov. 5, stopped 24 shots as the Islanders won for just the second time in 12 games since Oct. 15. It was DiPietro's 129th NHL win -- but the first in a game in which he entered in relief. New York led 3-0 and 4-2, but had to survive a late Montreal barrage after Gionta's power-play goal with 4:18 left in regulation cut the lead to one goal. "These are the types of games we have to learn how to win," said Isles forward Jay Pandolfo, whose second-period goal was his first as an Islander and the 100th of his career. "We found a way tonight, and we have to keep doing that." The Canadiens, 7-3-1 in their last 11 games, started backup goaltender Peter Budaj, whose misplay behind the net led to Parenteau's goal 41 seconds into the middle period. Budaj went behind the net to play Mike Mottau's rim-around, but didn't handle the puck cleanly. It bobbled to Parenteau, who had raced down the right side. He picked up the puck, took a step and slid home a backhander for his third goal of the season. Pandolfo, a longtime New Jersey Devil signed by the Islanders during training camp, scored off a picture-perfect 3-on-2 rush at 3:08. Josh Bailey carried the puck down the right side, Matt Martin crashed the net to draw the defense to him and Bailey found Pandolfo in the lower left circle for a quick snap into a half-empty net. It was Pandolfo's first NHL goal since Feb. 5, 2010. Former Canadien Mark Streit made it 3-0 at 9:08 by showing some persistence. His pass for Martin deflected off Montreal defenseman Rafael Diaz, but Streit kept moving to the net and swatted the loose puck behind Budaj. It was the first even-strength goal by a New York defenseman this season. Mottau then found himself in the wrong place at the wrong time twice, helping the Canadiens get back in the game with a pair of quick goals. The veteran defenseman tried to throw a pass from his own right corner up the middle, only to have it picked off by Lars Eller. He slid a circle-to-circle pass to Max Pacioretty, whose one-timer beat DiPietro cleanly at 14:52. Mottau then accidentally clipped his goaltender's skates during a scramble, allowing Eric Cole to pick up Diaz's rebound and fire it home at 17:38. But before the Nassau Coliseum crowd could get too nervous -- the Islanders blew a 3-0 lead a week earlier in a 4-3 overtime loss at Colorado -- the Isles got the kind of break they haven't been getting during their slump. Matt Moulson threw a pass from the right circle as Michael Grabner raced for the front of the net, and the puck hit the stick of defenseman P.K. Subban and floated past Budaj at 18:15. The Islanders killed a penalty to Grabner midway through the third period, but weren't so lucky when Steve Staios was called for boarding at 14:02. With 15 seconds left in the power play, Cammalleri gunned a pass toward the left post that hit Gionta in the leg. The Montreal captain knocked down the puck and punched it home for his fifth of the season to get the Canadiens within a goal. Montreal pressed for the tie in the final seconds, but DiPietro was sharp and Travis Hamonic blocked a shot from the slot by Cammalleri in the final five seconds.